As explained by Buddy Showalter, research engineer with the American Wood Council. This document is of use in seismic retrofit work because it addresses connections that are not found in the Simpson Strong-Tie Catalog or in ESR1539. Chapters 2, 8, 9, 11, and 12 are the most useful ones for the designer seeking wood or fastener strength properties. These chapters come under the headings “Design Values for Structural Members”, “Bolts”, “Lag Screws”, “Wood Screws”, and “Nails and Spikes.” For example, if the designer wants to know how far from the edge he can place a bolt from the end of the mudsill, this information can be found on page 58 of the 1997 NDS. The shear values for nails found in the chapter on “Nails and Spikes” is much more complete than the one found in ESR1579. It is important for designers to understand that the information found in this document should be considered a “published” and therefore legitimate value. Published values are either values found in tables in the NDS or are values that have been “calculated” using the tables in the NDS and modified through the use of engineering formulas. 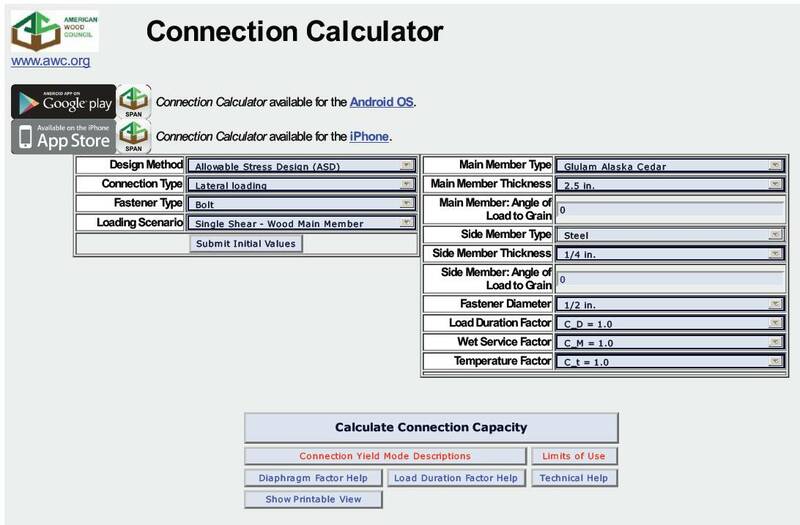 The NDS now has an online connector calculator. With it, one can determine the earthquake resistance of wood connection using Bolts, Lag Screws, Wood Screws, and Nails and Spikes. Instructions on how to use this calculator are at the bottom of this page. First, open another window on your browser and go to the Online Calculator At the bottom of the box you will see a tab that says “Submit Initial Values”. Open this tab. The webpage will now look like the image above. The drop down menus allow you to pick the type of connector whose shear strength you want to determine. Use the drop down arrow to pick certain characteristics as described below. FASTENER TYPE-Pick bolt, screw, or nail from drop down menu. The Main Member is wood that the side member is being attached to. For example, if you nail a block onto the mudsill, the block is the side member and the mudsill is the main member. MAIN MEMBER-Use drop down menu to select type of wood. In the Bay Area it will either be Douglas Fir Larch or Close Grain (old growth) redwood. MAIN MEMBER THICKNESS- Use drop down menu to pick thickness of main member. SIDE MEMBER TYPE-Pick Wood on drop down menu. SIDE MEMBER THICKNESS-Pick the thickness. If you are bolting through the side of a 2 by 4 the side member thickness would be 1.5.